The polls have closed and ballot boxes are beginning to arrive in Tadcaster’s Riley Smith Hall. 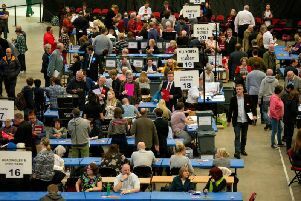 Volunteers are now starting to count the votes for the Selby and Ainsty constituency. Covering 327 sq. miles, 76,592 people were registered to vote in the seat at the 2010 election. In 2010, 71 per cent voted, 25,562 of whom voted in favour of Nigel Adams and the Conservative Party who won by a 23.7 per cent majority. The 2010 election saw a swing of 9.7 per cent from Labour to the Conservatives as Labour lost 17.3 per cent of their vote. Previously, the Labour Party won in 2005, 2001, and 1997 though the Conservatives won by a 15 per cent majority in 1992. The 2015 candidates are Conservative Nigel Adams, Mark Hayes for Labour, Lib Dem Nicola Turner, Ian Richards for the Green Party, UKIP’s Colin Health, and Trade Unionist and Socialist Coalition candidate Ian Wilson.